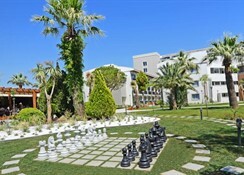 Palmwings Kusadasi Beach Resort & Spa is a luxury resort hotel located just 8.6 miles from the centre of Kusadasi. With its excellent beachfront location and a host of onsite amenities offering fun for all the family, this modern and stylish hotel ticks all the right boxes. The highlight of the complex is the large freeform swimming pool. Divided by a bridge and surrounded by palms and a furnished sun terrace this is just the spot for lazy days relaxing and soaking up the Turkish sunshine. 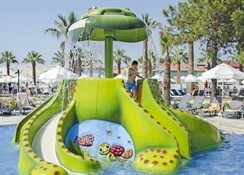 There is also a children¿s pool with fun water feature and a pool with water-slides. Foodies will find plenty of choice with a main buffet style restaurant serving national and international cuisine and 3 a la carte options offering a choice of seafood, Turkish and Italian cuisine. There is also a poolside snack bar and a number of other bars for daytime and evening drinking. 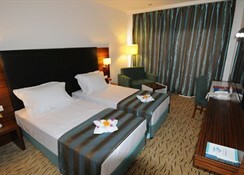 Families are well catered for with a playground, games room and a hotel run kids club. There¿s also plenty of entertainment on offer including quizzes, bingo, karaoke and cabaret shows. Other features include tennis and basketball courts, a gym and a sauna. 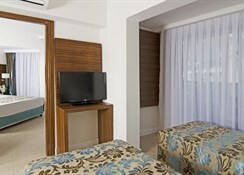 The 346 stylish guest rooms offer a host of facilities including a private bathroom with a shower or bath, double or twin beds, a flat screen TV with satellite channels and air-conditioning. 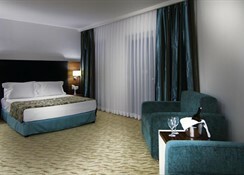 Other features include a hire safe, mini-bar and a balcony or terrace. Please note that some amenities may be payable locally. Palm Wings Kusadasi Beach Resort will not accept reservations made by Polish / Bulgarian / Romanian or Slovakian Citizens.